This is were I have a sort of love/hate relationship with this ink. For a blue ink it lays down a very pale colour. 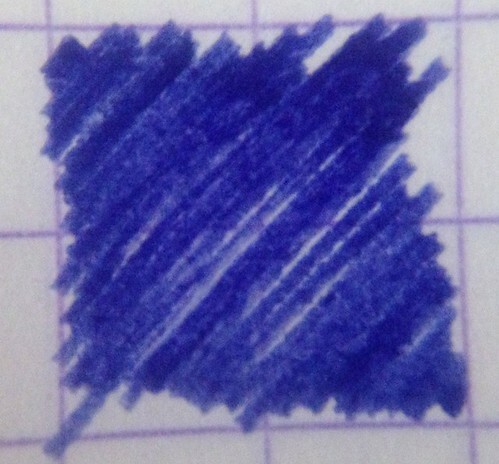 There seems to be almost a hint of a grey shading in this ink. I found that during the different stages of shading you only started to get a nicer depth of colour from stage 2 and on. During the writing samples you can really start to notice the inconsistency of the different depths of colour this ink lays down. 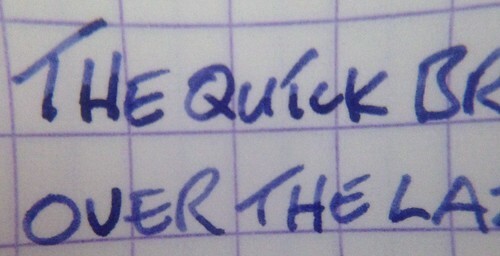 Certain parts of my writing are pale whereas others a much darker blue. This feels a very big contrast for me. The dry time for the Sapphire Blue is really impressive. I did get a slight smudge only at the 10 seconds mark but I believe this isn’t valid. The reason for this smudge I think was down to my finger being warm and causing the ink to smudge. Out of the various inks I have tested so far I have found this one to dry the fastest. I have been using this ink on and off for a good number of months now. No matter what fountain pen I have had inked with Sapphire Blue it has been very easy to clean and flush out. I so badly want to have a nice blue colour in my daily carry. Unfortunately this isn’t the ink I have been looking for. It is just to pale and inconsistent in colour for my taste. The quest continues! Is there a Blue ink that you would recommend for me to try? Feel free to leave a comment.